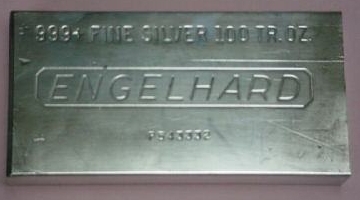 In Late September, 2010 we received our first of several reports of some suspicious Engelhard 100oz silver bars. They were underweight, and it at first appeared that they were real Engelhard bars that were shaved (where someone would cut off a small amount from the sides of the bar). However, upon receiving a sample, it turned out not to be made of silver, and is most likely lead. * Width and length of real bar have two separate values, due to the trapezoidal shape. What is the Fake Bar Made of? We believe it is a lead alloy, designed to match the density of silver, plated with a negligible amount of real silver. The ultrasonic thickness gauge shows the sound velocity to be very close to that of lead. How Does the Logo Look? The logo isn't quite as good as the videos make it appear. The first giveaway is that the top of the rectangle on the left side is broken with one part slightly higher than the other, which I'm sure Engelhard would never have done. The other problem is that the indented part of the logo isn't as shiny as the surrounding metal. What is the Shape of the Bar? 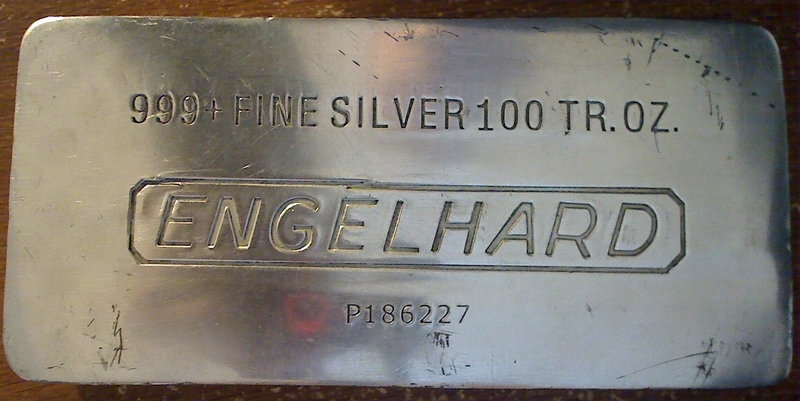 A normal extruded Engelhard 100 ounce silver bar is trapezoidal in shape. That means that the top at the bottom are both rectangles, but the bottom is a small rectangle than the top. That results in tapered (slanted) edges. The fake lead Engelhard bars have straight edges (so the size of the rectangle on the top of the bar is the same as the one on the bottom of the bar). How is the Finish of the Bar? 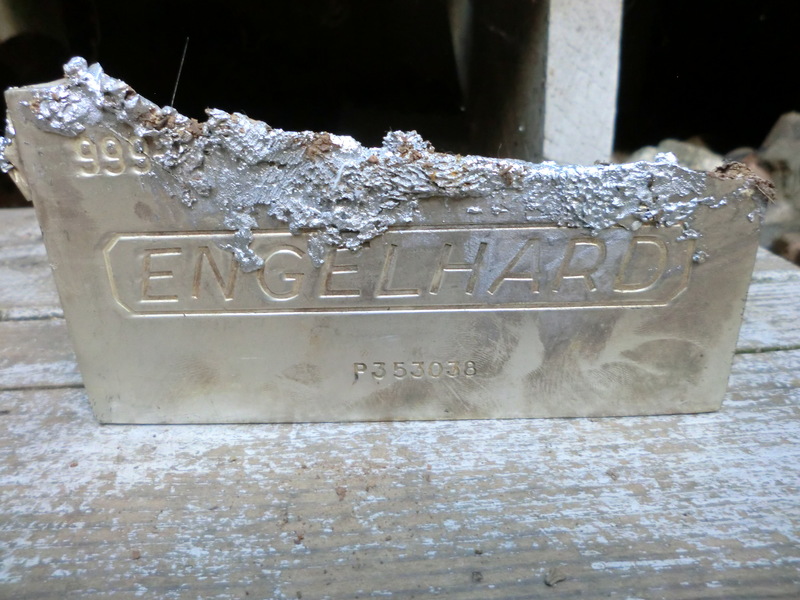 Genuine 100 ounce Engelhard silver bars usually either have a rough finish (if poured), or a 'matte' finish (smooth, but with very fine lines on it, not very reflective). The fake lead Engelhard bars, however, have a proof-like finish, almost as if the bars were polished. And they are very reflective (like a mirror). What About the Serial Number? 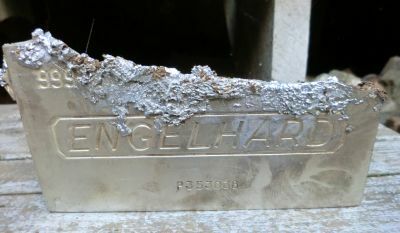 The serial numbers of the fake lead Engelhard 100 ounce silver bar use a different font than real Engelhard silver bars. In these images, you can easily see the difference in the numeral '8'. In the real bar, it looks like two circles on top of each other, whereas with the fake bar it looks like the number was drawn as a single line (not meeting where it started). You can also see the numeral '6' is different. On the real bar, the top of the '6' is more rounded, whereas on the fake bar it starts off straight. The bottom of the '6' on the real bar appears like a circle, whereas on the fake bar it again appears to be drawn as a line. The other numbers also appear different than those on genuine Engelhard bars. What About Marks on the Bar? As you can see here, the scratches, dings, and other marks on a genuine Engelhard 100 ounce silver bar differ in color from those on the fake, lead bar. The key here is that the fake bar is likely silver plated, so any marks will get through to the lead, showing a different color than the metal around it. Weight - For these bars, this is an easy and accurate test. These ones weigh about 10% less than they should. If it weighs less than about 99.8 troy ounces or less than 3100g, you should definitely be concerned. However, if the makers of these bars wanted to, they could make them the correct size and weight! Dimensions - The dimensions of these bars are off. The most noticeable is that they are 21mm thick, rather than the 27mm of a real Engelhard bar. However, as with the weight, if the makers of these bars wanted to, they could make them the correct size and weight! Seller - If the seller is in China, you really need to beware. The sellers of these bars were on trusted auction/sales sites, but with small sellers located in China. However, in the future, people from the U.S. that bought them will unknowingly resell them. Price - These were reported to sell for about 10%-20% under spot. This is high enough not to raise too much suspicion (thinking that the seller isn't aware of recent changes to the spot price, or bought them for much less and was happy with a smaller profit than they otherwise could get). And low enough to make people think they are getting a good deal. Correct Item? - It seems that the sellers of these are showing a different bar in the pictures than the one you receive, with a different serial number as well. Some of the sellers are just copying eBay auction descriptions, and likely copying the pictures too. Ring Test - By putting the bar in a plastic bag and tapping it with a hammer, you should hear a ringing sound if the bar is real. The bar we tested makes a 'clunk' sound (not a thud), that doesn't last as long as the ringing of a real bar. Magnet Test - A magnet will not stick to silver, lead, copper, or most metals. However, a rare earth magnet shows strong resistance when moved near or on silver (silver is diamagnetic). The fake bar we tested showed no signs of being diamagnetic (even though ), so a strong magnet showed no resistance near it. What Does it Sound Like (Ring Test)? When you put the fake bar in a plastic bag (so you are only holding the bag, not touching the bar) and tap it with a hammer, you hear a 'clunk' sound. With a real silver bar, you hear a ringing sound that lasts longer. How Did You Test with an Ultrasonic Thickness Gauge? You can see on YouTube. You can also see a detailed description on our site. We measure the thickness of the bar (the real one was 27.05mm, the fake one 21mm). We then both set the UTG to the velocity of sound in silver (3,650 M/s), and calibrate it. We then put glycerin on the bar, and use the probe to see the thickness measurement (26.9mm for the real bar, 34.1 for the fake bar). Since the thickness of the real bar matched that of the thickness displayed on the UTG, we knew that the real bar was made of real silver. With the fake bar, the real measurement and that shown by the UTG were very different, so we knew it was not real silver. We could then calculate by the real and displayed thicknesses, and the real velocity of sound in silver, what the actual velocity of sound in this material was (2,247 M/s). Unfortunately, we have no other information about this bar other than what you see. For those that are curious: PLEASE DO NOT TRY THAT AT HOME! Lead is poisonous, and needs to be handled carefully.